Learn more about introverts and why they are wonderful partners, and have a profound ability to connect deeply with others. As I have written about many times, I am a work in progress. I am constantly examining things in my life, figuring out how to make things better, etc. One of the things that I love about myself is that I can have a good time alone. Sometimes I need to be alone, but that does not replace good company. I have read a lot of self-help books, listened to seminars, read advice columns on how to be your best self and to seek your own approval before you seek the approval of anyone else. Although I believe that to be true, it is nice to have people in your life who tell you all of the wonderful things that you feel about yourself. It is nice to have people in you life who appreciate you and your contribution to the world. I’m not saying that we need outside confirmation to feel good about ourselves, but we should always be open to receiving it. There has always been a huge push for women in particular to be independent. We should all be able to support ourselves and be independent in all areas of our lives, but we must not let that independence close us off from well-intentioned individuals who want to share life experiences with us. We do not have to prove our independence by shutting others out and going it alone. We don’t have to do that. We were not put on this earth to go through life without the fellowship, love, compassion, and companionship of others. People need people! As a younger woman, I felt I had to prove that I didn’t need people in my life to be happy. I would go to out to dinner alone and be proud that I could do so without companionship. I wanted to prove that I could date myself, but I was honestly wanting to share a meal with someone. I am not saying that there is anything wrong with going to dinner alone, but there is also nothing wrong with wanting to be with someone. I need people. I have also mention several times in my previous posts that I am an introvert. I love being alone sometimes. I need to be alone sometimes, but I also need people in my life. I need to socialize. I need someone to hold me when I’m sad. I need to hold hands with someone at a concert. I need someone so sing Journey songs with me in the car. I need someone to laugh at my jokes. I need someone to tell me that I am beautiful, and there is nothing wrong with that. You alone cannot supply all of your needs and it is okay to want friends or a significant other in your life. I would like to challenge all of us to remain open to allowing people into our lives. Those who label themselves loners, antisocial, and even sometimes we introverts claim to not need people in our lives, but we do. A letter from Michael Schiller, founder of the Social Introverts Facebook Page, on his passion for helping introverts appreciate their own quiet perfection. It’s my cross to bear. 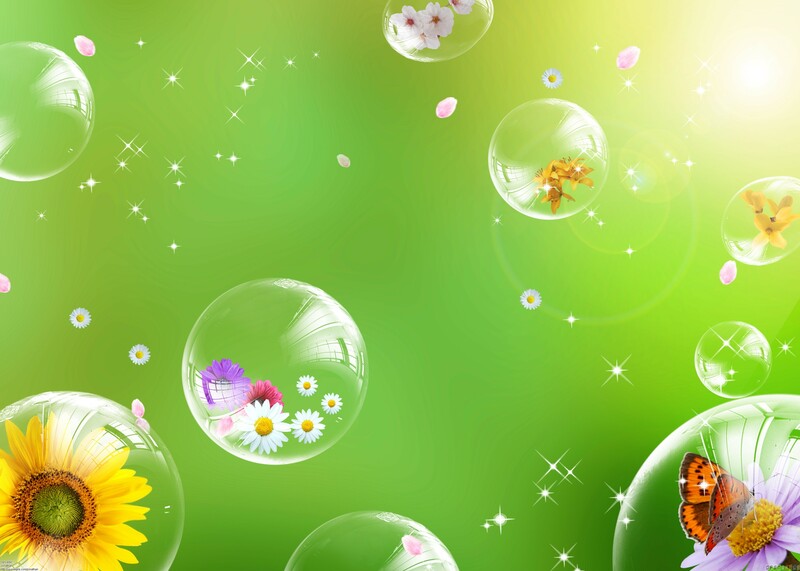 It confuses many people, but I am a bubbly introvert. I love people and like most introverts and I enjoy the company of others, but there are times when I need to be alone. I have a quick wit and a sense of humor. I’m loving, affectionate and compassionate, but I still need and crave time alone. As like most bubbles, mine eventually pop. There are times when I am in a small group of people and I am truly enjoying myself and the company, but then I need to leave. Oftentimes those in my company think they’ve done something to offend me or they believe that suddenly I’m not feeling well. They wonder what happened to the funny lady who has been cracking jokes for the past thirty minutes or so. 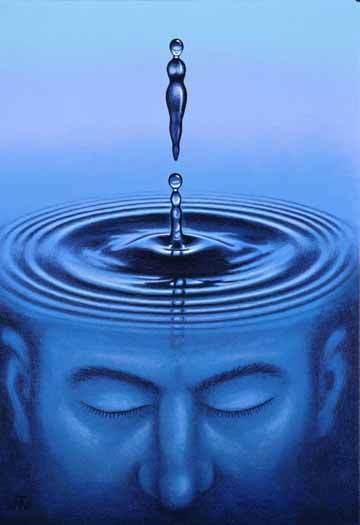 I have just reached my limit of social interaction at that time and I need that time away to refill my well. After spending a lot of time in social situations I begin to “power down”. This is especially awkward at dinner parties when I can’t just walk away with everyone else still sitting at the dinner table. I tend to get quiet and just sit there. I try my best not to let my desire to get up and leave show on my face, but sometimes it does. When that happens, I get the dreaded extra attention. People begin to ask me if I am okay. Even when I assure them that I’m fine, most of the time they don’t believe me. They feel the need to include me in the conversation and inadvertently draw attention to and increase my discomfort. What is difficult thing for most to understand is how I can be a bubbly, energetic person and then shut down. I often try to explain it, but it can be difficult to explain. Sometimes it doesn’t make sense to me. It is what it is. I feel this confusion comes from a misunderstanding of what an introvert is. We often see images of people concealed in hooded garments with all of the world shut out or images with captions that read “I can’t people today”, “People go away”, or some other standoffish command. Although I can relate to not wanting to “people” at certain times, that is not the case all the time or even most of the time. Being an introvert does not mean that I’m shy, have a personality disorder, or am unable to socialize. I am not uptight, arrogant, or hate being around people. I don’t even find socializing difficult, but I want to do it the way I want to do it and I need time to myself to recharge. That does not mean I can’t thrive in a crowd full of people. I can make it work, but I would chose to be in a smaller group of people I already know and even then, I will have enough and want to be by myself. I am also perfectly fine alone. I don’t need to be around people to enjoy myself, but I like everyone else, I need people in general. As the years roll by, I am getting more and more comfortable with myself. I am loving myself more. I am allowing myself to be vulnerable enough for others to love me the way I want to be loved. I am no longer making apologies for the way I am. I have fallen in love with myself and all of my eccentricities. One of the things about me I have embraced is my introversion. I no longer refer to myself as weird or strange, I am an introvert and I love it. Loving my introversion does not automatically make other people understand it. In a previous post I asked the question of other introverts if we should explain ourselves and our behavior to others. No we don’t, but we owe it to ourselves to not be ashamed it. As introverts we are often labeled as arrogant, snobby, antisocial, and selfish only because we need to spend time alone. Sometimes were are labeled as such because we feel the need to hide or disguise our behavior by sneaking away or constantly apologizing for not wanted to spend a large amount of time in the company of others. We don’t have to do that. I am giving all of us Introvert Sanction. We have to own our introversion by authoritatively taking that time for ourselves. I liken it to when I was breastfeeding. If I has my son with me, all of my friends and family knew that possibly a bare breast would appear. I felt no need to apologize for it or explain why it was happening and everyone learned to accept it. The same goes for introversion. We as introverts do not have to explain ourselves. We have to teach others by allowing them to see us as we are: reflective, careful, thoughtful, introspective, and understanding. All of these qualities are wonderful and we would be robbing the world of all of the value of our introversion if we do not fully embrace it. One of the important life lessons I have learned is there is power and happiness in vulnerability. Vulnerability in all areas of one’s life is liberating. I was always the strong one in all of my relationships. For years I took pride in being the one who could seemingly handle anything. l was the one everyone ran to with their problems. I was the person everyone could count on when they were falling apart, but when I was going through a challenging situation, no one was there for me. If I began to talk with a friend or family member about something difficult that I was going through, I was brushed off. I was told things like, “If anyone can handle it, you can” or “I’m not worried about you. You are strong enough to handle it.” In reality, I wasn’t. When others assumed that I could weather any storm, I became resentful. Then I realized that I created those relationships and I taught my friends to expect only strength from me. I needed that same strong shoulder to cry on that I had so willingly given others. No one viewed me as vulnerable, and by being seemingly strong person, I had created one-sided relationships. In every area of our lives we need the help, compassion, and love of others. I had mistaken vulnerability as weakness. 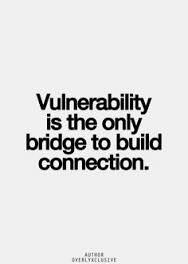 Without being vulnerable, we create weak relationships and deny ourselves true and intimate connections. I have only recently embraced my vulnerability and by doing so, I have been greatly rewarded. By letting my guard down my friendships have gotten stronger. I am beginning to get the help and support that everyone needs in life. There is strength in being vulnerable. In the next few posts I will continue to share how I have benefited from letting my guard down and being open to the help and support of others. I would like to challenge all of us to free ourselves from the burden of handling our own problems.